The Chillicothe Hornets Football Coaches, Players and Fans had their first taste of competition for the upcoming 2016 season with the annual 4-team Jamboree, this year hosted by Richmond. Each team had 12 plays, run consecutively, with no punting, kicking or extra points. If a team failed to make a first down, the drive started over at the 40 yard line. Chillicothe's first match up was against Grain Valley. The Hornets scored on a long drive that ended with a 1 yard touchdown run from Preston Hayes. 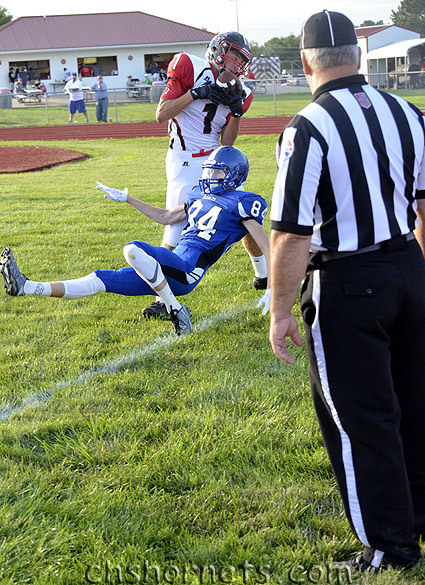 Chillicothe scored again a couple plays later when Quarterback Jack Willard found Brett Shaffer in the end zone for a 22 yard touchdown. On defense, Chillicothe kept Grain Valley out of the end zone thanks in part to interceptions by Kade Plattner and Jack Willard. In the final game, it was back to Varsity players with Chillicothe taking on Richmond. The Hornets scored on a two yard run by Josh Kille for their only score. On defense, a missed assignment gave Richmond a 40 yard touchdown run on a left side sweep play on the first play. The Hornets kept the Spartans out of the end zone the rest of the game. his players, but said he also saw some mistakes that needs to be corrected. He said that's what Jamborees are for, so coaches can have some good action before playing the first regular season game. In all, Willard said the team can build on what he saw out of them in the Jamboree.